Have heard of Clive Lloyd hitting the ball over Chepauk to canal (not sure whether this really happened ! or was that at Bombay !! )… have seen Krish Srikkanth hit a straight six in Marina to Wenlock park, the biggest six, I saw at Chepauk was Kirti Azad hoisting one ! … yet, this one was amazing – a clean 117 M hit. 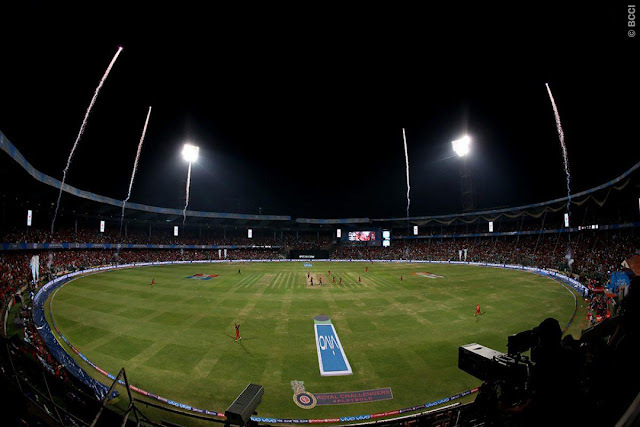 A certain six (the ball was well over the rope) was converted into one run and five runs were saved – I had posted on the athleticism of Benjamin Colin James Cutting – leaping in the air, grabing the ball with both hands and throwing it back inside the ropes – more was to be seen of him in the finals of IPL 2016. Chester-le-Street is a town in County Durham, England. Its history goes back to Roman times when it was called Concangis. County Durham is a ceremonial county and (smaller) unitary district in North East England. By some accounts the cricket ground has a capacity of around 12000 which is too low by Indian standards. 2nd Investec test between Srilanka and England is in progress and for sure the crowd would not have been 1/10th of what it was at Chinnasamy Bangalore. When partisan crowd was screaming in delight, at Durham, people were shown reading newspaper. What a finals it turned out to be on Sunday, 29th May 2016 - 6 Teams that have won the IPL; Sunrisers Hyderabad are the sixth, after Rajasthan Royals, Deccan Chargers, Chennai Super Kings, Kolkata Knight Riders, and Mumbai Indians. For Royal Challengers Bangalore, this was their third defeat in a final, after losses in 2009 and 2011. After over 16 – 47 runs were required with 18 balls to go, Stuart Binny and Sachin Baby were at the crease in a line-up that read : Virat Kohli, Chris Gayle, AB de Villiers, KL Rahul, Shane Watson ….. Chris Gayle gave a thundering start making 76 off 38 with 8 sixers – when he got out in 10.3, the score was 114 ! – Kohli too made a 50 .. .. yet it was SRH – there was the late surge from Cuttings, whose 15 ball innings read : 0 0 0 6 0 4 0 1 4 1 4 6 6 1 6. He has bowled more than 12000 deliveries in International Cricket, but was hit apart – perhaps in trying to dart the ball into the stumps from round the wicket, Shane Watson fell into a trap of his own. A slightly greasy outfield and a wet ball may have contributed to him slipping in full-tosses instead of yorkers, which kept getting picked away. One was massive and would remain ever talked about. Ben Cuttings hoisted him over deep backward square leg, for a massive 117 metres. SRH had a great bowling line-up. Bhuvaneswar kumar was outstanding and Mustafizur Rahman was very impressive. Still it was Bipul Sharma who had smacked some sixers in earlier matches providing the breakthrough of deVilliers wicket. This IPL saw sheer impudence of Mitch McClenaghan, the infinite variety of Dwayne Bravo's slower balls, yet so many spinners bloomed in the six-hitting carnage. Bipul Sharma was one, there was Kuldeep Yadav, Piyush Chawla, Amit Mishra, Sunil Narine, Krunal Pandya (who also made some big hits) Shiv Kaushik unorthodox action – Pune started playing leggie Murugan Ashwin alongside Ravi Ashwin. There was also Yuzvendra Chahal and the youngest of the leggies, Adam Zampa – overall, this IPL was exciting. The scorecard almost catches the excitement. Sunrisers Hyderabad 208 for 7 (Warner 69, Cutting 39*, Jordan 3-45) beat Royal Challengers Bangalore 200 for 7 (Gayle 76, Kohli 54, Cutting 2-35) by eight runs. In their first IPL final, Sunrisers Hyderabad showed their intent early by opting to bat against Royal Challengers Bangalore at a venue where tall scores have been chased down nonchalantly. David Warner, their leader, walked the talk and top-scored with a 38-ball 69, before Ben Cutting lent the finishing touches with an unbeaten 15-ball 39 to help them post 208 for 7. Eventually, however, it was their bowling line-up, the best in the tournament, that delivered the maiden IPL title with an eight-run win over the hosts at the M Chinnaswamy Stadium. Royal Challengers had breached the 200-mark thrice previously at home this season but choked at the final post… Now, the only Q is what will people who watched IPL for so many days, do from today on !!!! !